Understandably, our clients have many questions about our pet rehoming service. Our team are always happy to address your concerns and provide you with the information you need to feel confident and at ease with your decision to rehome your pet through Pet Rehoming Network. 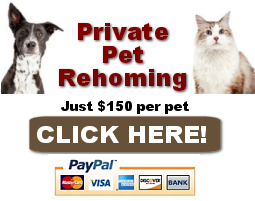 Pet Rehoming Network charges a fee of $179.95 to rehome each pet. This is a one-time fee, and covers our costs in creating and promoting your pet’s rehoming story throughout a wide variety of media. It also covers our costs for staff, phone services, Internet services and paid advertising services on Social Media and search engines. We provide you with an electronic adoption agreement drawn up specifically for you and your pet, and with careful follow-up for many months after your pet is adopted. Pet Rehoming Network is a virtual pet rehoming agency, offering pet rehoming services in every town and city throughout North America. Our pet rehoming team members are located in various areas throughout Canada and the USA including Maine, Colorado, New Jersey, Michigan, Oregon, California, Washington, Arizona, Texas, New York, Kentucky, Massachusetts, Michigan and Maryland – as well as Alberta, Ontario, BC and Newfoundland. Generally, rehoming a pet takes time and effort. If you know you are going to need to find a good home for your pet, the more notice you can give us, the better. We have been able to find homes for pets within days, but much of this depends on your pet’s characteristics – and your location. It is rare that we are able to successfully and carefully rehome a pet within a very tight deadline. Your pet will stay with you until a new home is found. There is nothing more stressful for a pet than to be placed in a shelter, and leaving your pet with a shelter is also incredibly upsetting for most pet owners. Dogs and cats are very territorial animals. They sense the fear, tension and anxiety of other animals, and they can experience a great deal of stress in a shelter environment. Not only that, they miss you terribly. Imagine what your devoted cat or dog would go through being abandoned by you in a shelter! What If My Pet’s Adoption Doesn’t Work Out? Is a Home Inspection Done On My Pets’ New Home? If your pet has a health issue that is going to be costly for the prospective owners, we really need to know about it. In these situations, we usually suggest that you set up a veterinary fund for your pet to take care of their extra expenses for the new owners. This can make people much more willing to adopt a dog or cat with a health problem. Many behavior issues can be helped or eliminated by placing your pet in a home where these issues will not be present. Removing the triggers can eliminate the problem. For example, a dog with severe separation anxiety can be placed in a home with people who do not work such as retirees. Cats that have litter box issues can be placed in a quiet, pet and kid-free home which can often solve the litterbox problems, which are often caused by anxiety and territorial behavior. Absolutely. We have rehomed many senior dogs and cats. Many pet owners love seniors. This is particularly true when the pet owners are seniors themselves. Taking on the responsibilities of a young pet (which may live 20 years or more) is not always an option for people who are in their senior years themselves. Not only that, younger pets require a lot more exercise and care than most senior dogs and cats. 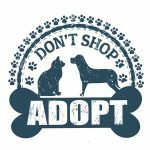 Most rescues and shelters will not accept senior pets, and you may have been told that they are “unadoptable” by these organizations. We have proven this to be false, and will be happy to help you find a very good home for your older dog or cat.